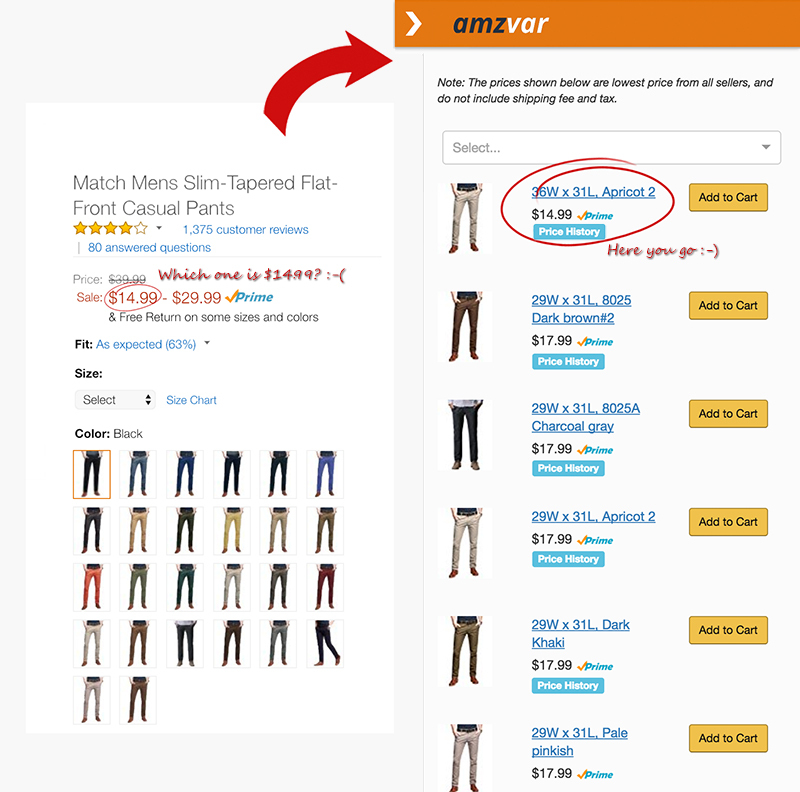 Because Amazon does not allow its API to be used in the Browser Extension, AmzVar no longer works as before. We are looking for new ideas, in the meantime, you might continue to use AmzVar to check the Price History and All Prices of the current product. List variations sorted by price. Filter variations by size or color if any. Provide the shortcut to view all offers to compare the price with shipping and tax. View price history provided by Camel3 ~ Note: not all products have price history available. Press 'shift' key to drag the toggle icon in case it blocks something beneath. Do you collect my personal information when using AmzVar? Is AmzVar browser extension free to use? Yes! And it's free forever :-). Why the toggle button does not show sometimes? AmzVar only shows on Amazon product page. Originally it only shows on product variation pages, but now it shows on any product page, for non-variant product, it provides the product recommendations. The toggle button blocks the links beneath, how can I solve this issue? The toggle button is actually draggable. What you need to do is that press the 'shift' key and at the same time left click on toggle button, then you're able to move it up and down. Stuck? No worries, shoot us a message!